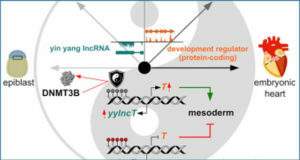 Although the function and mechanism of action of long non-coding RNAs (lncRNA) is still not completely known, studies have shown their potential role in the control of gene expression and regulation, in cellular proliferation and invasiveness at the transcriptional level via multiple mechanisms. 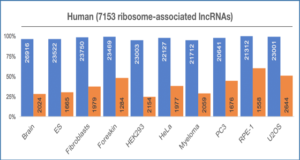 Recently, colon cancer associated transcript 1 (CCAT1) lncRNA was found to be expressed in colorectal cancer (CRC) tumors but not in normal tissue. 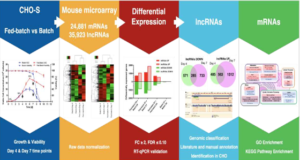 This study aimed to study the ability of a CCAT1-specific peptide nucleic acid (PNA) based molecular beacons(TO-PNA-MB) to serve as a diagnostic probe for in vitro, ex vivo, and in-situ (human colon biopsies) detection of CRC. 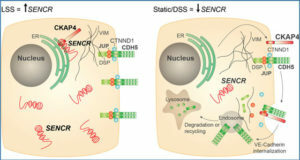 The data showed enhanced fluorescence upon in-vitro hybridization to RNA extracted from CCAT1 expressing cells (HT-29, SW-480) compared to control cells (SK-Mel-2). Uptake of TO-PNA-MBs into cells was achieved by covalently attaching cell penetrating peptides (CPPs) to the TO-PNA-MB probes. In-situ hybridization of selected TO-PNA-MB in human CRC specimens was shown to detect CCAT1 expression in all (4/4) subjects with pre-cancerous adenomas, and in all (8/8) patients with invasive adenocarcinoma (penetrating the bowel wall) tumors. 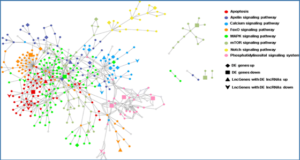 The results showed that CCAT1 TO-PNA-MB is a powerful diagnostic tool for the specific identification of CRC, suggesting that with the aid of an appropriate pharmaceutical vehicle, real time in-vivo imaging is feasible. TO-PNA-MB may enable identifying occult metastatic disease during surgery, or differentiating in real time in-vivo imaging, between benign and malignant lesions.